From left, Andrew Stothert, Ph.D., Ashley Gomez, Sharon Morais, Ph.D., and Juan Garcia. Thanks to a shadowing program this fall at UNMC, research is much more interesting now to Ashley Gomez, a recent Metro Community College (MCC) graduate. "I could see myself actually working in a lab one day," said Gomez, who is shadowing a UNMC postdoctoral student while being enrolled in the biotechnology program at the University of Nebraska at Omaha. 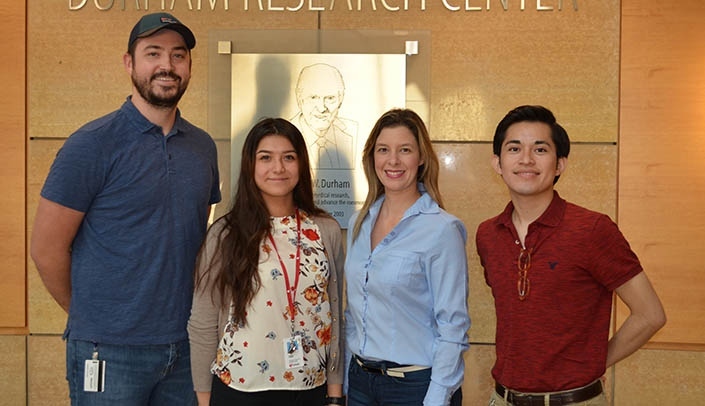 Gomez is one of two students currently taking part in a collaborative partnership between UNMC's postdoctoral education office and MCC's department of mathematics and natural science. While Gomez spent two days a week at UNMC shadowing Andrew Stothert, Ph.D., a researcher in the department of ophthalmology and visual sciences, Dr. Stothert spent two evenings a week teaching microbiology to students at MCC. The partnership grew out of a seminar series on professional opportunities for postdocs in 2015. One seminar on careers away from the bench was about teaching, and among the speakers were educators from MCC. The UNMC experience offers MCC students a chance to see real, cutting-edge medical research, said Alan Wasmoen, who teaches biology at MCC. "For some students, the chance to work side-by-side with a researcher has cemented their decision to pursue laboratory research opportunities; for others, observing the demands on a successful medical researcher may confirm their choice of another career. Either way, the time spent will have been worthwhile," Wasmoen said. On the flip side, the opportunity to teach two nights a week has been invaluable for Dr. Stothert. "Teaching students is so different from the scientific presentations you give at conferences," he said. "You learn how to connect with the students and make things interesting without all the jargon." Since the program began, there have been 14 MCC students who have participated and 14 postdoc students. Other current program participants include: Juan Garcia, a biology major at Creighton University who graduated earlier this year from MCC with a pre-clinical laboratory science degree; and Sharon Morais, Ph.D., a researcher in cellular and integrative physiology who also spent two evenings a week at MCC teaching anatomy and physiology through this partnership.